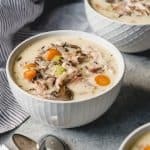 This Creamy Leftover Turkey Wild Rice Soup recipe is a hearty, satisfying soup that is full of carrots, mushrooms, celery and onion in a light, creamy broth. It's great for using up leftover turkey from the holidays and an easy, comforting classic that is perfect for chilly days! In a large dutch oven or heavy pot, melt butter over medium heat. Add the onion, celery, carrots, mushrooms, and garlic, and stir, sauteing until the onion has softened. Sprinkle the flour over the sauteed vegetables and stir in, cooking for 1 minute. Slowly add the broth, stirring constantly. Increase the heat to medium-high until the soup comes to a low boil. Reduce heat to medium and add the cooked wild rice, parsley, salt, pepper, thyme, rosemary, and shredded turkey. Simmer for 20 minutes. Add milk, cream, and lemon juice, and cook another 3-5 minutes until hot, tasting and adjust seasoning by adding more salt and pepper, if needed. Serve immediately. You could even just use a rotisserie chicken that has been pulled apart. Or if all you have on hand are uncooked boneless, skinless chicken breasts, add 1 1/2 pounds of uncooked chicken breasts along with the broth in step 3 and bring the soup to a boil. Cover with a lid and boil for 10-12 minutes until the chicken is cooked through. Remove chicken to a cutting board and rest for 5 minutes before chopping or shredding, then returning to the soup and adding the cooked rice and continuing with the recipe. Recipe adapted from A Farmgirl's Dabbles.